You’ve got to love the Swiss. Only they would be crazy enough to build a railway tunnel through one of the highest mountains in Europe just to take you to a lovely view. But I love the fact that they did, because it makes a fantastic half-day out from Wengen if you happen to be there for the skiing (or walking, if you’re there in summer). Based on my visit though, it would appear that the trip to the highest railway station in Europe is of little interest to skiers – as I was the only one on my train. Maybe they think they’re getting a good enough view from the slopes, maybe they’re enjoying the skiing too much to take the time out, whatever the reason, I think they’re mad, it was a trip I wouldn’t have missed for the world. Being the only skier didn’t mean I was the only tourist though – in fact the train was quite full with an entirely different group of tourists, who it appears to come to the area just to visit the Jungfraujoch – Chinese & Japanese tourists. I first encountered them at Kleine Scheidegg station (where you have to change trains if you’re coming up from Wengen). It was pretty early in the morning, as I wanted to have a full afternoon of skiing, and so there weren’t many skiers around – but the platform was full of these tourists, mostly being photographed clustered around a stereotypical St. Bernard dog (complete with mini barrel around his neck). The journey up to the Jungfraujoch – the saddle between the neighbouring Mönch & Jungfrau peaks – takes quite a while, as the rack railways climbs steeply, up past the highest ski lift at Eigergletscher before entering the tunnel through the Eiger and continuing its steady ascent, on the way pausing for a while at two stations. The first, Eigernordwand, gave me a chance to get out and wander out to three huge windows cut right into the legendary North Face of the Eiger. 64 climbers have died since 1935 attempting to climb it, and today the windows have a dual function – as well as allowing tourists like me to get a view across the valleys, it’s also the start point for missions attempting to rescue climbers in trouble. The next stop, Eismeer, has spectacular views out over the Lower Grindelwald Glacier – from where you used to be able to ski all the way down to the town of Grindelwald, until it retreated in recent years. Finally we arrived at Jungfraujoch station, which at 3,454m high is the highest in Europe (and cheekily named ‘the Top of Europe’ in their marketing materials, which it clearly isn’t). For such a remote and beautiful location, the complex itself is surprisingly tacky – there are several very touristy restaurants, and an ‘ice palace’ carved into the glacier, full of cheesy ice statues of polar bears and the like. These distractions didn’t detain me for long, for I was only really there for one thing – to get outside and see the view. It didn’t disappoint – with the Jungfrau and Mönch rising up on either side, and impressive views out towards Wengen and on towards Interlaken, and best of all, from the open platform at the top of the observatory you get a truly spectacular view over the start of Europe’s longest remaining glacier, the Great Aletsch. 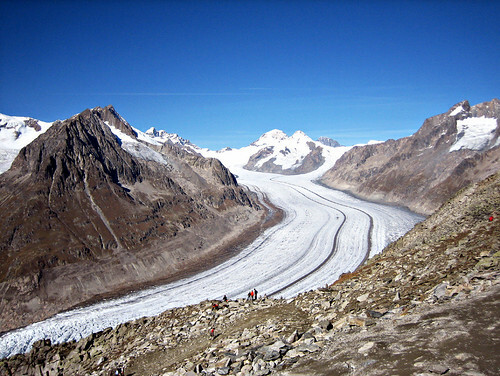 Right behind the Jungfraujoch, three small glaciers converge at the massive Konkordiaplatz, at which point the ice is estimated to be a full kilometre thick. The scale of it is ginormous – it covers a whopping 120 square kilometres, and bends away into the distance on its long, 23 kilometre descent towards the Rhone Valley. I’ve only seen tiny glaciers before elsewhere in the Alps & in the Andes, but this one is a monster, and it’s one of the most beautiful sights I’ve ever seen. I stayed far longer than planned, it was so breathtaking, and headed back down amazed that so few of the people visiting Wengen or Grindelwald for the skiing make the effort to go up, especially when you consider that the cheapest way to visit by far is if you’re already skiing. Non skiers have to pay €133 return from Interlaken, which must be one of the most expensive train fares in Europe. Skiers with a 6-day ski pass for the area pay a massively reduced rate – about €40, which is still pretty pricey considering the distance, but easily worth it. You can see all of my photos from my visit to the Bernese Oberland here.